On Tuesday, the eggs at Slimbridge were candled (tested for fertility) and at least two eggs are looking good! One egg from the first clutch and one from the second. As described in the blog announcing the eggs, the captive Spoon-billed Sandpipers at Slimbridge produced two clutches of eggs around two weeks ago. The first clutch, of three eggs, appeared to contain eggs of poor quality with the first two eggs looking chalky and thin-shelled, and the third egg soft-shelled. The second clutch looked much better and was a complete clutch of four eggs. Here’s what’s happened to the eggs since they were laid. Unfortunately but not unexpectedly, the third egg from the first clutch (the soft-shelled one) collapsed after only a few days. The egg was sent to Professor Tim Birkhead‘s team at Sheffield University for analysis. The other two eggs from the first clutch (the thin-shelled ones) lost water too quickly over their first few days of incubation and were moved to a more humid incubator. Despite the best efforts of the team to restrict water loss, one of these eggs continued to lose water rapidly. After 5 days of incubation, it had already lost over 15% of its total weight which is what we’d hope for after the full 21 days of incubation. We lost hope quite early on that this egg could support a viable embryo. BUT surprisingly the second thin-shelled egg reacted well to the humid incubator and its weight loss quickly took on a normal trajectory. 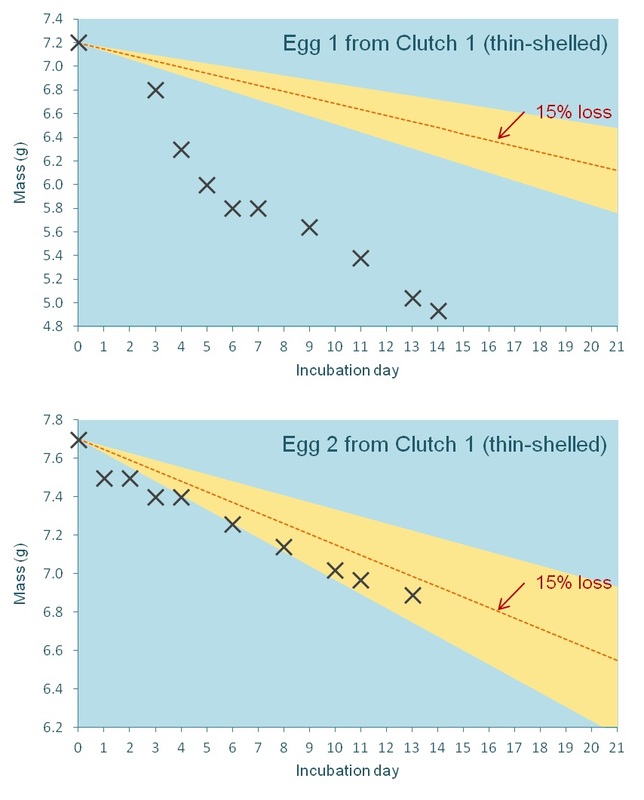 Weight loss graphs: These two graphs show the amount of weight (or mass) lost by the two remaining eggs of the first clutch. You can see in the top graph that egg 1 has lost weight far exceeding the 15% loss we’d expect, while egg 2 initially lost weight too quickly but has now recovered. The four eggs from the second clutch have lost water (and therefore weight) basically as we’d expect. Although we aim for approximately a 15% weight loss, eggs of different sizes, shapes and shell composition will naturally vary from the 15% ‘ideal’ and generally anything between 10 and 20% can be ok. So these eggs aren’t perfectly on the 15% line but all are within normal bounds. One of the four has lost weight a bit quicker than the other three (which we think might be because of a tiny Spoon-billed Sandpiper toenail-sized puncture hole) but with extra humidity is not too far off track. And then they were candled. Candling is the simple process of checking the fertility of an egg by simply holding the egg up to a light source to illuminate what’s going on inside. As you can probably guess, it gets its name from when people used candles as the light source. After around seven days of incubation, if an egg is fertile, it’s usually possible to see blood vessels and even movement by the tiny embryo. A lack of blood vessels is an indicator that an egg is either infertile or that the embryo died very early in incubation. But it isn’t always clear cut. Some egg shells are too thick to allow good illumination and as you can imagine, blood vessels and embryos in Spoon-billed Sandpiper eggs are incredibly small and sometimes just not visible until later in incubation. The eggs at Slimbridge were candled on 21 June – about half way through incubation. We were of course hoping that all the eggs would be fertile but based on the experience of other wader breeding programmes, there was also a good chance none would be fertile. The two thin-shelled eggs were candled first. The first egg, the one that is losing water far too quickly, showed no signs of embryo development and its thin shell gave us a clear look inside. The second egg, however, looked good! Blood vessels and a live embryo. Fantastic and unexpected considering the quality of these eggs. The four ‘good’ eggs were next. Nothing could be seen in eggs one, two or three. We can’t be certain that these eggs don’t contain living embryos. The shells seem a bit thicker than normal and it wasn’t possible to get a really good look. So the conclusion is that these eggs are probably not developing but there’s a small chance they are so they’ll continue to be incubated. We expected egg four to look the same as its clutch mates, but when the light was flicked on, there were blood vessels! Hurray!! So we have two eggs that are definitely fertile and developing, one definitely not and three probably nots but possibles. And it’s great that the two eggs are from different clutches and therefore have different parents and different genetic backgrounds. All being well, the thin-shelled egg is due to hatch on or around Wednesday 29 June and the other fertile egg three days later, on or around Saturday 2 July. Fingers-crossed that two tiny fluff balls with long legs and funny-looking bills are wobbling around us very soon! Spoon-billed Sandpipers weight about 5 grams when they hatch – about the same as a teaspoon of sugar! The Comments section has been fixed! We would love to hear from you. Let’s hope your amazing work is rewarded! Progress indeed, sorry to hear that there are not more, but a marvellous achievement nonetheless. As you say, fingers crossed for the remaining unknowns. I’m so pleased for you all and especially the Spoon Billed Sandpipers! All your hard work has paid off Really feeling for you all… It must be such a nerve wracking time? Gave my toy spoon billed sandpiper bird such a big hug Thank you so much for keeping us posted Praying now for a successful hatching! Huge news, well done all – everything crossed for a successful hatch. Thank you for the kind comments everyone and apologies again that you haven’t been able to comment until now. It means a lot to the team at Slimbridge and the team in Russia to hear your words of support at this busy, busy, stressful time! It’s like a virtual high five which is very much appreciated! This is excellent news. Keep up the great work. Looking forward to successful hatching and raising of the young this year! Well done. Lets hope the eggs hatch.